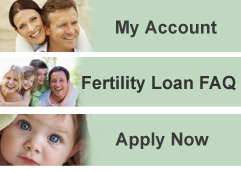 ﻿ FertilityFinance.net offers many different repayment terms on our fertility Loans. Locate your estimated Loan Requirement and your preferred Repayment Term (in months) on the chart below. Refer to the chart to determine the range within which your estimated Monthly Loan Repayment will fall. Your estimated Monthly Loan Payment (within the range) will depend upon your Credit History and Current Financial status.